It's possible there's no phrase in Magic more powerful. From Moxen and Show and Tell, to Mind's Desire and Bloodbraid Elf, to Gurmag Angler and Aetherworks Marvel, "cheating" mana costs has been a hallmark of some of the game's most powerful cards for Magic's first 25 years. No matter the year, no matter the format, you could be sure to find cards that help you get ahead on mana at the top of the game. Which means that this exciting card making its return to Core Set 2019 comes out on top of well, basically everything. That's right, Omniscience is making its return—and you can be sure players will be paying no mana costs for their spells at all. There is simply so much you can do with a card like Omniscience, and odds are, you won't be paying any mana at all to do it. "A card like this isn't for everyone, of course. It costs a zillion mana and doesn't win the game by itself. It requires some effort to get it to work. It's not a tournament staple and you're not going to jam it into every deck that plays Islands, but that's not the point. To me, a lot of the value you get from a Magic card comes well before you sleeve it up. Again, it's about possibility." Six years after Omniscience first appeared, we've certainly explored those possibilities quite deeply. From the wacky Standard deck that ramped into Omniscience just to win with Door to Nothingness, to the Legacy deck that puts Omniscience into play with Show and Tell, to the Commander decks across the world that aim to stall the game until they can cast Omniscience with Enter the Infinite in hand (with Laboratory Maniac soon to follow), Omniscience has demonstrated time and again why it has excited Magic players for all these years. Zac encapsulated it perfectly back then—it's about all the things you could do with it. Sure, sometimes it rots away in your hand as an uncastable ten-mana card, but no one remembers those games. We remember the game we cast it for free with Unexpected Results. We remember the games we ramped into a lightning-quick Omniscience only to play out a hand full of giant monsters and flood the field early. We remember the games where Chaos Warp revealed Omniscience on top of our decks and elicited a groan from the rest of the table. With Omniscience, we get to break one of the most fundamental rules of Magic. It almost doesn't matter what happens after that—we just know it's going to be memorable. Of course, in order to break those rules, we're going to need to get our bomb ten-mana enchantment into play. While I wouldn't expect this to happen much in Core Set 2019 Limited—though I'll certainly be trying if I get the chance—things change quite a bit in the 60-card formats. I've already mentioned how Omniscience has been used in the past, but what about the present? With the much-heralded return of Llanowar Elves to Standard, I wouldn't put it past crafty Simic (that's green-blue) mages to try and make it work—possibly alongside Nexus of Fate. 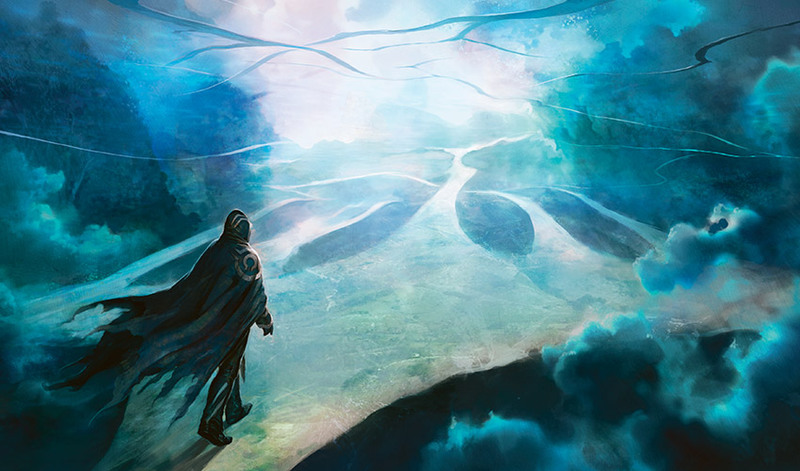 We've already seen Omniscience's pedigree in Legacy, and who knows what's possible in Standard these days. We've certainly seen a big shakeup with Dominaria, which brings plenty of ramping options to the table for players trying to get creative with Omniscience. I mean, come on—have you read Hour of Promise? That card is begging to be played alongside Omniscience, and along with Grow from the Ashes, Thunderherd Migration, Gilded Lotus, Song of Freyalise, and a host of mana creatures, it's surprisingly easy to ramp up to ten mana in current Standard. By the way, Growing Rites of Itlimoc exists, and it's the perfect card to both ramp you to Omniscience and help you find cards to cast for free once you've made it to ten mana. I'm not sure where Omniscience will fit into Standard after the release of Core Set 2019, but I know plenty of players out there will be trying to find out. One place we know the enchantment will see play is the realm of the 100-card brews. It's best friends with Academy Rector and amps up the fun alongside cards like Unexpected Results and Chaos Warp, but Commander is a different beast where you don't actually need to warp your deck around Omniscience—simply playing normal Magic will get you there. Commander games are renowned for going long, and whether or not you have green in your deck, ten mana is surprisingly achievable thanks to the number of mana rocks like Sol Ring, Chromatic Lantern, Everflowing Chalice, Gilded Lotus, and Signets that abound. Just trade resources with your opponents for a while, and as soon as their guards are down, drop Omniscience on the field and ask if they have an answer. And if you do happen to have green in your deck—perhaps Kruphix, God of Horizons—things get downright silly. A few good Rampant Growths and Farseeks can ramp out Kruphix, which can in turn store mana for a quick Omniscience, leaving you with plenty of cards in your hand to play for free. There is one caveat to remember—casting cards without paying their mana costs means you won't get to choose "extra" modes like the overload on Cyclonic Rift if you cast the card with Omniscience. But that's a small price to pay since as soon as your Omniscience resolves, things become quite straightforward—can your opponents knock you or your Omniscience out of the game before you find the cards to take over? The beauty of Omniscience is that it comes with a form of protection: if it hits the battlefield, it no longer matters that you're tapped out—all the cards in your hand can be used to protect. That means barring any Krosan Grip shenanigans, all those Counterspells and Disallows are free to protect Omniscience from whatever the threat may be. From there, all you need is more cards to win the game, and there are plenty of options, from Jin-Gitaxias, Core Augur (which comes with the benefit of also messing up your opponents' hand sizes) to Arcanis the Omnipotent for obvious flavor reasons, giant Eldrazi monsters for free, or even something like Consecrated Sphinx to give you a continuous flow of cards and allow you to play "normal" Magic if you don't have a win condition immediately available. All of your cards will be free, so no one will know what to expect. Like I said, Omniscience creates infinite possibilities, and it's up to you to figure out exactly what you want to make of it—that's the beauty of Omniscience. 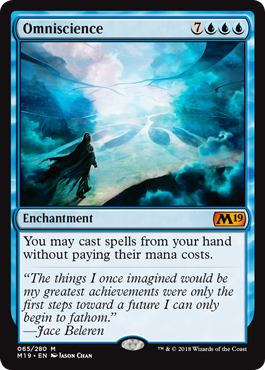 I've barely begun to scratch the surface of what you can do with this iconic enchantment, but as players have shown throughout years and throughout formats, it's well worth the effort to find a way to make Omniscience hit the battlefield. I have no doubt it will be the same with Core Set 2019, and I can't wait to see what spells we won't be paying the mana costs of over the next few months.